Planning to start an apple orchard, Richard and Chrissie Spanton bought 60 acres and a house just outside of Rockton, Illinois in 2006. Then they bought the building and land next door and created one of the state’s loveliest luxury escapes, the Copperstone Inn at Orchard Ridge Farms. The Inn’s 1858 Greek Revival limestone building was a three-year labor of love as the couple transformed it into a magnificent bed and breakfast and spa. Originally 9,000 square feet, the Spanton’s added another 8,000 square feet, utilizing many of the original features and materials, such as wood and slate flooring, barn wood siding, and tin and copper ceilings. Today, the Copperstone Inn offers seven suites, each with its own unique charm, all boasting a variety of extras to enhance a guest’s stay, such as Jacuzzi tubs, fireplace, or private balcony. Delicious gourmet breakfasts, six common areas, an outdoor kitchen and fireplace, and a home theater are some of the other great amenities offered. Relaxation is key to a stay here, and that’s just what you’ll find at the Copperstone Spa, where guests can choose from four massage treatments designed to relieve stress and tension; and a Body Polish treatment that leaves skin feeling fresh and invigorated. As an additional enticement to stay, the Inn offers several packages, including a farm stay package that offers guests a chance to work with the orchardist and get hand-on experience in the orchard. 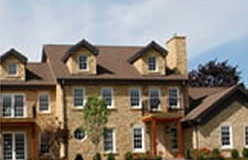 With its beautiful country setting, Copperstone Inn is also an ideal site for weddings and special parties. In addition to the spacious main Inn, the couple built a Pavillion making them able to accommodate up to 500 guests. 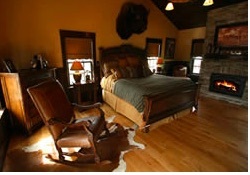 Copperstone Inn is a member of the Illinois Bed and Breakfast Association and offer a unique lodging experience! This entry was posted in Illinois Bed and Breakfasts, Touring Illinois and tagged Illinois Bed & Breakfasts, Illinois towns, Orchards by admin. Bookmark the permalink.